LAWRENCE, Kansas — The bedroom door was slightly ajar, creating just enough space for the 10-year-old boy to peek inside. Udoka Azubuike couldn't help himself that night eight years ago in Nigeria. He'd never heard sobs like this before—especially not from his father, Fabian, who sat on a mattress and scratched furiously at the golf-ball-sized sores on his swollen legs, the ones that had rendered him bedridden and unable to walk. "My father was a proud man, a police officer," Azubuike says. "But when I looked through the door, I saw tears. My whole life, I had never seen my dad cry. The look on his face that night, the sadness…"
Azubuike pauses and rubs his eyes. Nearly a decade later, the image still haunts Kansas' 7-foot center. "I'm sorry," he says. "I don't really like to talk about my past." And for nearly two years at Kansas, Azubuike hasn't. Not to the reporters who pepper the NBA prospect about his background. Not to the KU teammates who will play alongside the 280-pounder in this weekend's Final Four. Not even to coach Bill Self and his assistants. Azubuike occasionally reveals bits and pieces about his childhood, they say, but the majority of the details have remained private. It's just before 5 p.m. on Tuesday, and most of the Jayhawks bounce around the Allen Fieldhouse locker room, shadowboxing and bobbing their heads to rap music as excitement builds for Saturday's NCAA tournament semifinal showdown with Villanova. Azubuike, though, sits quietly in the corner of the adjoining player's lounge, speaking softly amid the commotion. Excited as he is about the Final Four, he can't truly embrace where he's going without remembering where he's been. Perhaps that's why, as he leans back in a leather recliner, Azubuike decides to reflect on a journey that started well before he arrived in the United States as a 13-year-old—a journey filled with poverty, heartache, terrorism and fear. A journey, he says, that began the night he peered through that bedroom door. Whenever the violence began in Delta, Nigeria, young Udoka Azubuike—still in elementary school—always remembered the instructions from his mother, Florence. Armed robberies often occurred in broad daylight. And it wasn't uncommon for shootings, kidnappings and beatdowns to take place in the middle of a busy street. "I just got away from it as fast as I could," Azubuike said. "I saw so many terrible things, so much violence during that era. I don't like my mind to think back on it. I try to [pretend to] tell myself it never happened." As he recounts stories from his childhood, it's easy to understand why Azubuike chose to bottle them up and keep them inside. In the late 2000s, he said, the Nigerian government grew corrupt and was in a state of upheaval. His mother, a middle school teacher, would often go long periods without receiving a paycheck. Money became so scarce that Florence and Fabian were forced to sell furniture from their home simply to feed Udoka and his four older siblings. There were numerous stretches when Udoka ate just one small meal per day. The financial strain that hovered throughout Delta created tension, angst and, eventually, desperation. "A lot of people didn't have jobs because the government was so bad," Udoka says. "For a lot of them, the only way to eat was through violence. They would just walk up to people in the street and attack them and rob them just so they could have money for food." One afternoon, Udoka says he was in the vicinity when police officers shot and killed a man who had attempted to steal food from a store to curb his hunger. "I walked up and the dude was just laying on the floor, dead," Azubuike says. "I'll never forget that. He didn't have anything to eat, so he stole something and got shot and killed for it. I just saw his body laying there, and man…I don't know how to describe it. It just really touched me. It made me feel…"
Azubuike looks away and stares at the wall, his thought left unfinished. With each passing year, the conditions in Delta continued to worsen. In 2009, when a radical Islamist militant group called Boko Haram staged an uprising against the Nigerian government, citizens lived in fear like never before. Regarded as one of the world's deadliest terrorist organizations, as designated by the United States, Boko Haram is believed to have killed tens of thousands of people in the last nine years while kidnapping countless others and displacing millions from their homes. "They were going around killing Christians," Azubuike says. "Everyone was scared." It was also in 2009 when Udoka's father fell ill. At first it was just some swelling in his feet, but eventually it extended past Fabian's knee caps and into his thighs. The condition became painful, and the tumor-like bumps that surfaced all over his legs produced a relentless itch that made it difficult for Fabian to sleep. Florence sold off more of the family's belongings to cover the medical bills that followed each new attempt at treatment. Yet even when some of the sores began to ooze with liquid, doctors never could diagnose Fabian's illness. "It was eating the life out of him," Udoka says. To this day, a part of him believes his dad was poisoned. Fabian died in 2010, just a few hours after Udoka visited him in the hospital. His last memory of his father, though, is from the scene he'd witnessed at home a few months earlier. "My dad always wanted to be positive," Azubuike says. "He didn't like to show weaknesses. He liked to show strength. I never thought he'd be in a condition like that, with tears in his eyes. Seeing that changed my life. "Even though I was only 10, I changed my mind about my whole situation. I decided I was never going to let something like that happen to me. I was going to do something with my life. I was going to make something of myself. I was going to wait for my opportunity, and when it came, I wasn't going to hesitate." Harry Coxsome has watched almost all of Udoka Azubuike's games the past five years. But the story he loves to tell the most involves not a basketball but a piece of pizza. Coxsome and his wife, Donna, became Azubuike's "host parents" when he moved from Nigeria to Jacksonville, Florida, back in 2013. A few days after his November arrival, during a shopping trip to Sam's Club, Harry bought a slice of pepperoni pizza and offered it to the then-6'8", 180-pound 13-year-old. When Azubuike backed away and scrunched up his face, the realization hit Harry: Not only had Udoka never eaten a slice of pizza, but he'd also never seen a slice of pizza. "He had no idea what it was," Harry says. "I convinced him to take a bite, and his eyes just lit up. I'll never forget the look of joy on his face. In three seconds, that piece of pizza was gone." The previous summer, Azubuike had caught the attention of high school recruiters at a Basketball Without Borders camp in Nigeria. One of them placed a call to Steve McLaughlin, the head coach of Potter's House Christian Academy in Jacksonville, and Azubuike's size alone was reason enough to offer him a spot in the program. Three years after vowing to leave Nigeria for a better life, Azubuike had his chance. "I didn't think twice," Azubuike says. "I wanted to survive." Udoka said his mother felt good about the decision, too. Painful as it was to bid farewell to her son, Florence knew he was headed to a safer environment, with academic and athletic opportunities he'd never experience in Nigeria. And as a deeply religious woman, she felt comforted knowing Udoka would be surrounded by people strong in their faith both at PHCA and in his new home with the Coxsomes, who were devout Christians. "The day we met Udoka," Donna Coxsome says, "I told him, 'The minute you walk into house number 4687, you're a part of our family.' And that's how we've treated him." The connection was strong from the start. Donna searched until she found stores with clothes that fit Udoka's long, lanky frame, and she discovered his favorite dish was okra and shrimp with rice. Harry, then an assistant coach at PHCA, helped make sure things went smoothly at school and on the basketball court. Within one month, the Coxsomes said they'd "fallen in love" with Udoka. "We got to a point where we were like, 'This kid is ours,'" Harry says as he wipes away a tear. "We viewed him as our son. There's no difference. He started calling me 'Dad' and my wife 'Mom.' It's hard to put into words. It was just a special, special feeling, where everything just seemed meant to be." A few months later, after filling out the proper paperwork, Harry and Donna became Udoka's legal guardians. "They didn't take me in because of basketball," Udoka says. "At that time I was 13 and no one knew if I was even going to play Division I or JUCO or anything at all. They did it because they had the desire to help someone. They laid the foundation for me for everything I'm doing now." Udoka's time in Jacksonville certainly wasn't void of challenges. Although it's not labeled as a prep school, PHCA is demanding when it comes to academics. Azubuike relished it, taking Algebra I and Algebra II at the same time as a freshman and geometry and pre-calculus a few years later. Each night when he returned from practice, Azubuike would shower, do homework until he was called for dinner and then return to his desk, sometimes working well into the night to complete his assignments. No wonder he says he rarely watches television. Even today, Azubuike will say that one of his biggest accomplishments was making the National Honor Society at PHCA, an achievement that earned him a special tassel for his graduation day cap. "From the moment he got here," Harry says, "he was excited about academics. He was eager to learn." The same could be said of Azubuike on the basketball court. A soccer player until he was 11, Azubuike had never experienced high-level basketball until he arrived in the United States. In his very first game as a freshman at PHCA, Azubuike was matched up against future NBA All-Star Joel Embiid, who was a senior at The Rock School in Gainesville. The following summer, his EYBL (Nike's AAU league) squad played against teams featuring Duke stars Marvin Bagley III and Wendell Carter Jr., who had been playing virtually their whole lives. Still, when Kansas assistant Norm Roberts saw Azubuike in the summer of 2014, he sensed something special. "My first thought was, 'Is this guy the next Shaq?'" Roberts says. "The only thing he did was dunk it, but when he dunked it, he tried to rip down the rim. I told Coach [Self] that he was a straight power guy, but after he saw him, he was like, 'No, that frickin' dude is a good athlete. A good athlete.'" Azubuike narrowed his choices down to Kansas, North Carolina and Florida State before finally choosing the Jayhawks thanks, in part, to his first opponent in high school. "Embiid called me and assured me Kansas was the place for Udoka," Harry says of the former Jayhawk. "He told me about how great everything there was. He and Udoka have talked, too. I know he really looks up to Joel." Someday soon, people may be looking up to Azubuike, too. The first time she met Udoka Azubuike, Kansas strength coach Andrea Hudy asked the 303-pound freshman whether his goal was to get stronger or to lose weight. "I'd prefer it," Hudy said, "if you answered, 'Both!'" Azubuike attacked Hudy's challenge with fervor. Within a year he'd dropped nearly 40 pounds, weighing in at 266 before the 2017-18 opener. Azubuike is now listed at 280, but the 14 extra pounds, he says, are all muscle. "Hudy put me on a meal plan," Azubuike says. "Nothing after 10 in the evening, no soda, no Gatorade. Only water. I was picking the right foods to eat and working out. I was dedicated to doing what she asked me to do." Although Self has erupted at Azubuike a few times this season—even offering to buy him a pacifier because he said he was playing so soft—Azuibuike is one of the most physically imposing players in all of college basketball. He may not be as chiseled as Arizona's Deandre Ayton or as nimble as Bagley, but ask opponents about the 7-foot fire hydrant with a 30-inch vertical leap and a 7'5" wingspan, and it's clear he leaves an impression. "Every time he hit me," Seton Hall's Angel Delgado told The Athletic, "I felt like my body was about to break." Entering the season, one of the biggest knocks on Azubuike was that his offense was limited to dunks. Hoping that he'd add to his arsenal, Self prohibited Azubuike from slamming the ball during fall workouts, instructing scout team players to force Azubuike to score away from the basket. "You can't always just think, 'I'm going to catch it, back my man down and dunk over him,'" said Roberts, the assistant coach. "Sometimes there are going to be other guys who are 250 pounds who aren't going to let you do that." While more than half (118) of Azubuike's field goals (207) have come on dunks, he's also added a hook shot—over either shoulder—to his repertoire. Along with leading the country this season, Azubuike's school-record field-goal percentage of .772 is the second-best mark in Division I history. Even more impressive, Azubuike achieved his gaudy numbers while shouldering the burden of being KU's only reliable post player through virtually all of the regular season. 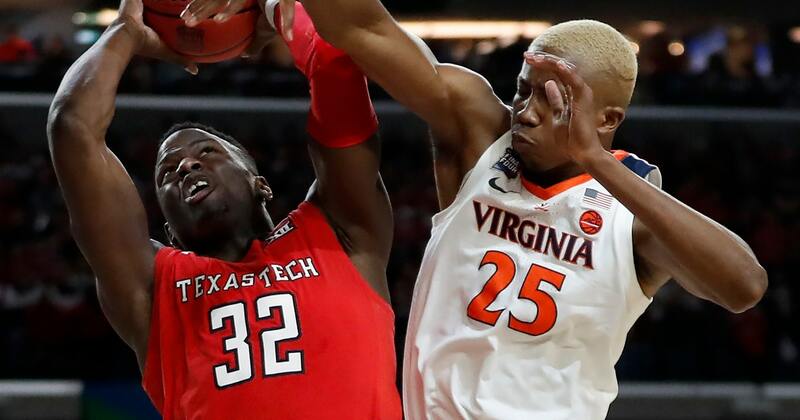 The emergence of freshman forward Silvio De Sousa in the Big 12 tournament has taken some of the stress off Azubuike. But not much. "I'm anxious to see how much better he does when he can really play without restrictions—when he can just go out there and relax and play," Harry says. "[Kansas] is so thin up front, so he can't risk getting into foul trouble. It's holding him back from being explosive and dominant." Azubuike fouled out of Sunday's Elite Eight win over Duke in just 19 minutes—but not before sending the CenturyLink Center crowd into mayhem with a pair of alley-oop slams that will be shown on Jayhawks highlight reels for years to come. The question now is whether Azubuike will be around next year to tack on any more. 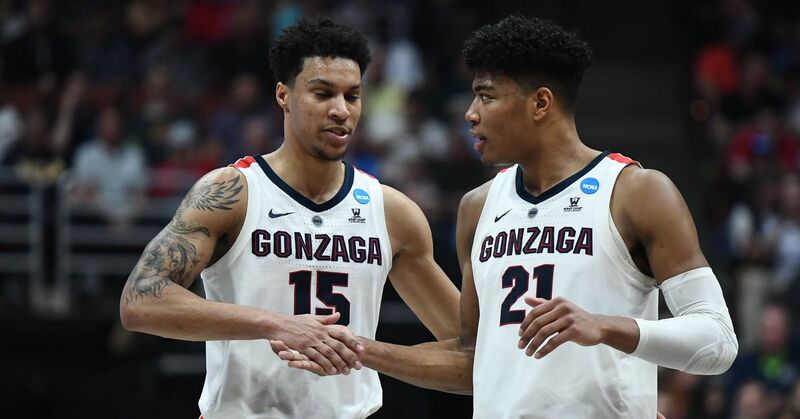 Although his name isn't featured in any 2018 mock drafts, a strong performance in the NCAA tournament—and, more specifically, the Final Four—can alter a player's path in a hurry. At the very least, Coxsome says he expects Azubuike to "test the waters" by attending the NBA combine and working out individually for teams before making a decision whether to return to KU for his junior year or turn pro. "If the opportunity presents itself in a good way, he'll have a tough decision to make," Coxsome says. That's a choice for another day. First comes a national semifinal matchup Saturday against Villanova. And if helping Kansas win its first national title since 2008 isn't motivation enough, Azubuike will also be playing for the first time in front of his birth mother. The NCAA pays up to $3,000 in travel expenses for parents of players participating in the Final Four, and Kansas officials helped Florence obtain a last-minute visa that will allow her to fly from Nigeria to watch her son on the sport's biggest stage. Florence and Udoka haven't seen each other since he left Nigeria in 2013. And Udoka said poor cable service has prevented his mom from ever watching one of his games on TV. "Can you imagine, you've never seen your son play basketball," Self said, "and now the first time you do it is in front of 70,000 people. I can't even imagine what's going to go through her mind." A surreal moment, indeed. Not just for Florence, but Udoka, too. He's had plenty of them since leaving his native country. Lately, Azubuike is becoming increasingly sentimental—and more appreciative—as he continues to find success on his journey. On his 18th birthday last September, he sent Harry a heartfelt text, thanking him and his wife for opening their home all those years ago, for accepting him into their family. In Lawrence, Azubuike is opening up more to his teammates, and the Jayhawks' coaches loved seeing him get animated—screaming and thrusting his fists in excitement—during Sunday's win over Duke. "One thing about most of the African kids that move here is that they're very close to the vest, at least initially," Roberts said. "But they're very loving kids, too. They want to be hugged and accepted. Joel [Embiid] was that way. Udoka is, too. "They get very close to you when you show them love and caring." No matter what happens from this point forward, Azubuike will always feel that warmth in Lawrence—whether it's from the 16,300 fans at Allen Fieldhouse or the students who shop and linger and party on Massachusetts Street downtown. He'll experience it at the Coxsome home in Florida, too. As for Nigeria, even though his mom is there, Azubuike doubts he'll ever go back. Simply talking about those memories is painful enough. The last thing he wants to do is relive them. "My journey, my life and everything I'm trying to do isn't in Nigeria anymore," Azubuike says. "I don't see anything over there for me. "My life is here now. This is where I feel at home."